August brings visions of endless sunshine and sizzling holidays. It's a time savoured by many – and a perfect month to jet off to idyllic shores and alluring beaches. Sunbathing may fill many itineraries, but there's lots more to spice up your holiday plans! Explore ancient cities, winding through mysterious streets. Savour local tastes cooked up by talented chefs. Where will your holiday haven be? Find your inspiration below! 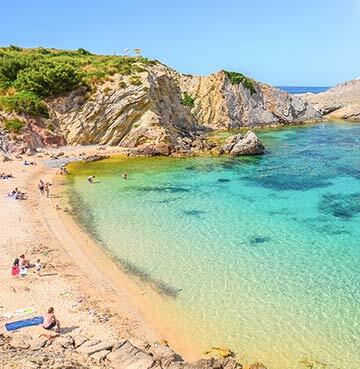 We've dived into Sardinia, Ibiza and Menorca where temperatures reach a tantalising 29°C. These are just some of the dazzling destinations for an idyllic getaway of sun and sand or adrenaline and adventure! Pack your best swimwear and trendy sunglasses, Sardinia is calling! This Italian island oozes with twists, turns and hidden surprises. Settle your beach towel on wondrous white sands for a picture of true serenity! Admiring piercing turquoise waters, which make for amazing swimming spots. Pockets of glitz and glamour shimmer in the north and crevices of adventurous mountains takeover inland. Find your August escape among these irresistible shores, with temperatures reaching an impressive 30°C. 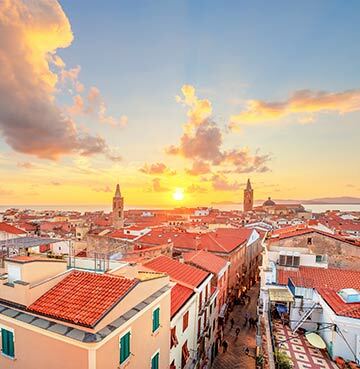 A holiday in Sardinia wouldn’t be complete without a dip into the wonder of Alghero. The summer glow in August brings this city to life! Exploring the medieval Centro Storico (historic centre) conjures images of cobbled lanes and Gothic piazzas lined with traditional cafés. ‘Little Barcelona’ thrives from its Catalan roots with Spanish Baroque sitting among Roman ruins. Wind your way through narrow lanes, marvelling at the artistically designed Santa Maria cathedral. All that exploring means hungry appetites! Choose from many classic restaurants serving spaghetti to seafood. And who can resist a delicious creamy gelato for afters? In the south, picturesque resorts Capitanna, Torre Dell Sell and Flumini complement the lively capital of Cagliari. Each offers its own unique Sardinian vibe, with a selection of villas offering an idyllic base for your holiday. If you fancy yourself as an active holidaymaker, head inland and dive into mountainous terrain. Nature lovers will feel at home here too, with flamingos, golden eagles, mountain goats and white donkeys inhabiting the greenery. Whether you’re a party-goer or a beach-goer, find your August holiday haven in Ibiza. Let its glistening coastline tempt you for sun-kissed memories of the Mediterranean. The nights may jump to lively beats, but the days flow to laidback notes. Discover Ibiza’s hidden side, away from the hustle and bustle of the crowds. Your happy hour lasts all day in undisturbed villages and quiet coves. Take in the calm atmosphere of local rural inlets, scattered with olive and lemon groves glowing in the summer haze. Pop over to Formentera for views of striking salt flats in the balmy sun. A day out at Ibiza’s Old Town, Dalt Vila, is packed with sights of ancient ramparts and classic buildings overlooking its calm harbour. There’s also plenty of opportunities to shop ‘til you drop - onto one of the many picture-perfect beaches that is! A white beach is just a stone’s throw away at Santa Eulalia, paired with pretty whitewashed houses and a beautiful marina. Or perhaps a villa in the traditional village of San Juan sounds even more tempting? Take your pick from classic and modern bars among rustic Spanish streets around your home from home. Where will your Ibiza getaway take you? Menorca’s tantalising coastline and alluring sands attract holidaymakers from far and wide in August. You may be tempted to spend endless days soaking up the sun in these paradise surroundings. And who could blame you? These Balearic shores are blessed with some of the most idyllic scenes of the Mediterranean. Finding a quiet haven in a quaint cove is all part of your holiday bliss. Son Bou stands out as a striking coastal gem, with 2km of sandy shores. Or head to the quiet cove overlooking azure ocean waters in Arenal D'en Castell. Feeling like stretching your legs for panoramic views over the horizon? Explore the path of Cami de Cavalls which circles the island on foot, or trot giddily on horseback. A stop at S'Albufera d'Es Grau Nature Reserve is fantastic for all ages, whether you simply admire with your eyes or make a muddy splash in scattered puddles! Explore intriguing wetland areas which home many species of wildlife in this UNESCO Biosphere Reserve. Find your fix of thrills in Punta Prima or Cala en Bosch. Family fun overflows from the waterparks dotted around the island, so take your pick from awesome adrenaline adventures, wild waves or speedy slides. If you fancy a more relaxing experience, opt for a bubbly chill in a Jacuzzi. Beaming smiles are promised with so much choice for everyone! Start your summer fun even sooner with a July Villa Holiday or enjoy a late summer adventure with a September villa holiday.